I love ice cream, especially in the summer time. Ice cream loves me too….it likes to hang around long after the taste is gone (think: ” A minute on the lips, a lifetime on the hips). So I was most excited to learn about Skinny Cow ice cream products a few summers ago. I am a fan of the traditional ice cream sandwich-vanilla ice cream, with chocolate cookies as bookends. The vanilla Skinny Cow ice cream sandwiches are outstanding–unlike a lot of “lite” products, they are a decent size and don’t taste “lite”. I passed these out recently to my husband and my mom, and they both thought gave the vanilla Skinny Cow thumbs up. The Skinny Cow website is full of information on healthy lifestyles, a downloadable walking journal, and the Weight Watchers points value for all products (they don’t make a dessert over 3 points! How great is that?). There’s even a “flavor finder” that can point you to a store that carries the product you crave. Thanks to Mom Central for the opportunity to participate in this blog tour! I am always looking for ways to improve my health. Not that I’m sickly, but if there’s something I can do to make myself healthier, I’m always interested in learning about it. 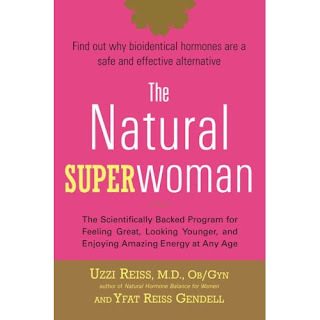 The Natural Superwoman by Dr. Uzzi Reiss has given me a lot of new information to think about and investigate when it comes to my own personal medical care. Included in the book are ways to optimize nutrition, the importance of socialization, and the importance of physical activity. I started reading the book expecting these things–but in it I found so much more. Dr. Reiss explains that in addition to the above, a vital aspect of women’s health is her hormonal health. He goes into depth explaining the function of each of the main hormones in our bodies, and how deficiencies in any of these can seriously impact every function of the body. Dr. Reiss is an expert in using bioidentical hormones to improve all aspects a of woman’s health, and a good percentage of the book is dedicated to explaining the benefits of this course of treatment. Bioidentical hormones, in case you were wondering, are different than the synthetic hormones found in birth control pills, fertility treatments, and menopausal treatments. While explaining the benefits of bioidentical hormones, Dr. Reiss outlines the dangers of synthetic hormones. In the Author’s Note at the beginning of the book, Dr. Reiss acknowledges that what he practices goes against conventional medicine, yet what he practice is backed up by reputable scientific sources. He urges women not to settle for treatments that don’t work and may actually cause harm, and to try the least invasive/most natural remedies first. 1) The goal of Western medicine is to keep you alive. Not to keep you feeling your best, but to keep you alive. Therefore, a “normal” test result means that you don’t need any lifesaving treatment at this moment. It doesn’t mean that there isn’t something you could do to make yourself feel better (less fatigued, less cold, less prone to gain weight, whatever your ailment is). 2) Western medicine tends to treat the symptom, rather than the cause of any given symptom. In review of my own medical history, I can see it happening again and again. I was given pain killers for my back pain, but the root cause wasn’t investigated. I was given birth control pills for my irregular periods, but the root cause wasn’t investigated. I was suddenly plagued with ear infections when I was twenty years old–I even had ear surgery to correct it–but the root cause wasn’t investigated. It sounds harsh I know, but the more I think about it, the more it makes sense to me. This knowledge puts a lot more of my family’s health care in my hands, and the Natural Superwoman is a great reference tool for just that. Can you tell I had unexpected free time today? Sadly, MAM is sick. She’s asleep though, so I’m catching up on the important things, like Bloglines, and what not. Anyway, it’s Weigh-in Wednesday and I am where I was last week. Today is significant, however, because not only is is Weigh-In Wednesday, it’s also Ash Wednesday. Which means Lent is starting. Which means it’s an automatic back-on track day, because I’m fasting today. Which is good, and rather odd, because I haven’t been really hungry, whereas usually, I’m FAMISHED when people tell me I can’t eat (bloodwork, surgery, fasting for Church, whatever). Last year I made a feeble attempt to give up eating between meals for Lent. I think I’m going to try it again this year–so far, I’m off to a great start. Maybe I should always plan a warm-weather vacation during Lent. It might be the extra motivator I need to really sacrifice for the season. See how everyone else did at Tales from the Scales!